The Lebanese Armed Forces (LAF) (Arabic: القوات المسلحة اللبنانية | Al-Quwwāt al-Musallaḥa al-Lubnāniyya) or Forces Armées Libanaises (FAL) in French, also known as the Lebanese Army (Arabic: الجيش اللبناني or "Armée libanaise" in French), is the military of the Lebanese Republic. It consists of three branches, the army, the air force, and the navy. The motto of the Lebanese Armed Forces is "Honor, Sacrifice, Loyalty" (Arabic: "شرف · تضحية · وفاء" - Sharaf.Tadhia.Wafa'). The Lebanese Armed Forces symbol consists of a Lebanon cedar tree surrounded by two laurel leaves, positioned above the symbols of the three branches: the ground forces represented by the two bayonets, the navy represented by an anchor, and the air force represented by two wings. The Lebanese Armed Forces' primary missions include defending Lebanon and its citizens against external aggression, maintaining internal stability and security, confronting threats against the country's vital interests, engaging in social development activities and undertaking relief operations in coordination with public and humanitarian institutions. The armed forces consist of 72,000 active personnel with the ground force consisting of approximately 65,000 troops, the air force 2,000 personnel and 5,000 in the naval force. The remaining personnel are commanders, advisors, engineers and members of the special forces. All three branches are operated and coordinated by the LAF Commander; a position customarily held by a Maronite Catholic Christian, from the ministry of defence which is located in Yarzeh, east of Lebanon's capital, Beirut. The current commander in chief of the Lebanese Armed Forces is General Joseph Aoun. Currently, the LAF is ranked sixth in the world in terms of growth, with the number of military personnel doubling over the period between 1985 and 2000. The country has six military colleges and schools. Lebanese officers are sent to other countries such as the US, Russia or other parts of Europe to receive additional training. The equipment of the LAF is outdated due to lack of funds, political bickering and until the 2000s, the presence of foreign forces. The Lebanese government is working with its partners to improve the armed forces' capabilities. After the conclusion of the Lebanese Civil War, the LAF decided to repair as much of its equipment as it could, while being aided by modest donations from other nations. The United States remains a key partner for Lebanon in this improvement process. About 85% of the LAF's equipment is American-made, with the remaining being British, French, and Soviet-made. Historically, being the crossroads of the ancient world and the modern world, Lebanon have been inhabited and defended by various different empires and nations be it natives or invaders. Notably, the Phoenicians who were the natives of Lebanon, constituted the first notion of defenders of Lebanon, as recorded by various historical sources, the Phoenicians brutally rebelled and fought different empires such as the Egyptians, Babylonians and Assyrians and Greeks... Later after, Lebanon became a part of the Roman empire for almost 5 centuries, the veterans of two Roman legions under Augustus were established in the city of Beirut (the Legio V Macedonica and the Legio III Gallica). However, The Lebanese Army finds its original local roots in the armed forces that were first formed under Prince Fakher el-Din II the Great in the early 17th-century during the Principality of Lebanon (1516-1842). The first major victory came on October 31, 1622 against the Ottoman Empire Army under the lead of the Pasha of Damascus in the Battle of Majdel Anjar. Outnumbered (5,000 Lebanese soldiers against 12,000 Syrians), Fakher el-Din was nevertheless victorious and was able to capture the Pasha of Damascus himself and take over Syria, Galilee and parts of Transjordan. During the period of the semi-autonomous province (Mutasarrifia) period of Mount Lebanon between 1861 and 1914, no Turkish troops were allowed to station within its boundary. Lebanon established its own army made up of volunteer militias; "the free independent bearing of these mountaineers was in striking contrast to that of the underpaid, underfed and poorly clothed conscripts of the regular [Turkish] army". The beginnings of the modern Lebanese Army arose during 1916, when the French government established the "Legion of the Orient", which included Lebanese soldiers. After a post World War I League of Nations mandate was established over Lebanon in April 1920, France formed the Army of the Levant, which was later reorganized into the "Troupes Spéciales du Levant" (Special Troops of the Levant). These troops were composed of Lebanese and Syrian enlisted personnel, but were commanded predominantly by French officers; however, the percentage of Lebanese and Syrian officers in the force gradually increased in size to approximately 90% of the total number by 1945. Later in 1926, the Lebanese First Sharp Shooters Unit was created out of the Special Troops of the Levant; it is considered to be a direct precursor to the Lebanese Armed Forces (LAF). During World War II, Lebanese troops fought in Lebanon with the Vichy French forces against Free French and British forces. After the Vichy forces in the Middle East surrendered in July 1941, volunteers from the Troupes Spéciales du Levant enlisted in the Free French forces and participated in combat in Italy, North Africa, and southern France. In 1943, prior to the declaration of Lebanese independence, all the military units were combined in one brigade, the Fifth Brigade, under the command of General Fouad Chehab. On the day Lebanon declared independence, the Lebanese Third Sharp Shooters Regiment was placed at the disposal of the Lebanese government in order to maintain security. In June of the same year, the French reconstituted units of the Troupes Spéciales du Levant, which were then attached to the British forces in the Middle East. The majority of the Lebanese Armed Forces remained a part of the French Army in Lebanon. After gaining independence in 1943, the Lebanese government formed an official delegation in 1944 to negotiate with the French the terms related to handing over the LAF. After nearly three weeks of talks, the joint French-British Command decreed that responsibility for armed units under French control were to be handed over to the Independent Government of Lebanon. These units were part of the Troupes Spéciales du Levant and totaled about 3,000 men. On August 1, 1945 at 00:00 hours, the LAF was placed under full authority of the Lebanese National Government; this day is commemorated annually as Lebanese Army Day. After establishing authority over the LAF in 1945, the Lebanese government intentionally kept its armed forces small and weak due to the country's unique internal politics. Christian politicians feared that Muslims might use the armed forces as a vehicle for seizing power in a military coup. They also appeared unwilling to incur the cost of maintaining a large well equipped army. Throughout the 1950s and 1960s, Lebanon never spent more than 4% of its GNP on the military budget. Many Christian Lebanese also feared that a large army would inevitably force Lebanon into the Arab–Israeli conflict. However, Muslim politicians were also worried that a strong army could be used against Muslim interests because it would be commanded by Christians. At the same time they tended to feel that the military should be strong enough to play a part in the Arab-Israeli struggle. In addition to the two major conflicting views, prominent Lebanese politicians of the myriad religious denominations in Lebanon have also tended to be feudal warlords commanding their own private militias and feared that a strong army would endanger their personal power. In 1948, the Lebanese Third Sharp Shooters Regiment fought Israeli Forces occupying the Lebanese village of Malkieh in the northern Galilee and captured it, and that by the orders of Lebanese defense minister then, Emir Majid Arslan II. This was the first major combat operation for the Lebanese Armed Forces under the Independent Lebanese Government. The Lebanese Ground Forces, القوات البريّة, literally "Ground Forces", are by far the largest of the three branches of the military. The Fourth Brigade was previously active but was disbanded in 1984. Includes the Mountain Combat Company. The Lebanese Army still uses equipment mostly received through donations or friendly prices. Its work horse is the M113 which is commonly used by every regiment and brigade. A collection of Western and Soviet made weaponry and equipment exists ranging from rifles to tanks. However, the Lebanese Army is trying to rearm and modernize itself through new aid and purchases from different countries such as the United States, Belgium, Russia, and The Netherlands. A list of awaiting-for-delivery armaments is constantly growing and includes M60 Patton tanks, M198 Howitzers, etc. A recent Russian promise to supply Lebanon with T-90 tanks has been in discussion since the Lebanese Defense Minister's last visit to Russia on December 16, 2008. Throughout history the Lebanese Army employed different weapons and equipment which, at the time, were considered state of the art. Most of these arms have either been phased out of service or sold to other countries. Among the major equipment that is not currently active are AMX-13, Saladin, Panhard M3, and Staghound vehicles. The Lebanese Air Force, القوات الجوية اللبنانية, are the aviation branch of the Lebanese Armed Forces. It currently has a number of helicopters including the Bell UH-1H Huey, Aérospatiale SA 330 Puma, Gazelle, Cessna Caravan, Hawker Hunters, and various others. The air force is currently in the process of restoring its jet capabilities and considering the purchase of a small number of fighters or jet trainers. The Lebanese Navy, officially the Lebanese Naval Forces, القوات البحرية اللبنانية, is responsible for protecting Lebanon's territorial waters, ports, and fighting illegal smuggling of goods. At the head of the naval hierarchy is the Navy Command, then it branches off into the quarter-general of the Navy, the Department of Naval Equipment Stores, the Naval School, Beirut Naval Base and the Jounieh Naval Base. The navy, which currently lacks a suitable amount of equipment, has approximately 50 vessels of various sizes and roles; however, it is trying to modernize itself, and increase its size. To ensure the effectiveness of such an elite force, many Commandos are sent overseas to nations such as the US, UK and France to receive extra training in specialized areas that the Lebanese Armed Forces are unable to provide, due to a lack of resources. While training in Lebanon, each Commando is instructed in the art of urban and guerrilla warfare. So rigorous is their domestic training regime that each commando is subjected to a training timetable consisting of 20 hours per day for 3 months, which is divided into different stages. Each stage consists of a specialized form of warfare and its associated tactics. Such tactics include: sabotage, sniping, extraction and covert operations. The Lebanese Special Forces are also well known for killing and eating snakes with their bare hands at graduation ceremonies. In 2008, the Lebanese Armed Forces started establishing the Lebanese Special Operations Command in order to group the LAF's elite units. These special operations forces will include the Airborne Regiment, the Rangers Regiment, the Navy Commandos Regiment, and the Counter-Sabotage Regiment of the Military Intelligence. The initial size of the force will be less than two brigades, around 5,000 troops, but the plan is to enlarge it up to three brigades. The Staff and Command College, Military Academy, and Mountain Skiing Fighting School are training centers for Lebanese soldiers designed to upgrade the quality of their skills while the High Center for Military Sport is designed to keep them in peak physical shape (it also organizes sports groups and teams for international competition as well). The Training Institute is designed to help soldiers specialize in certain aspects of the military, such as artillery and defense. Lebanon previously had mandatory military service for men only. All men were required to do 1 year of military service through age 18+. Training was only done whenever they had free time or time off school including summer vacations and holidays. There were also training done alongside high school. On May 4, 2005, a new conscription system was adopted, making for a six-month service, and pledging to end conscription within two years. As of February 10, 2007 mandatory military service no longer exists in Lebanon thus making it a conscription-free all-volunteer force. Infantry weapons, which are available in the Lebanese army and its tactics. 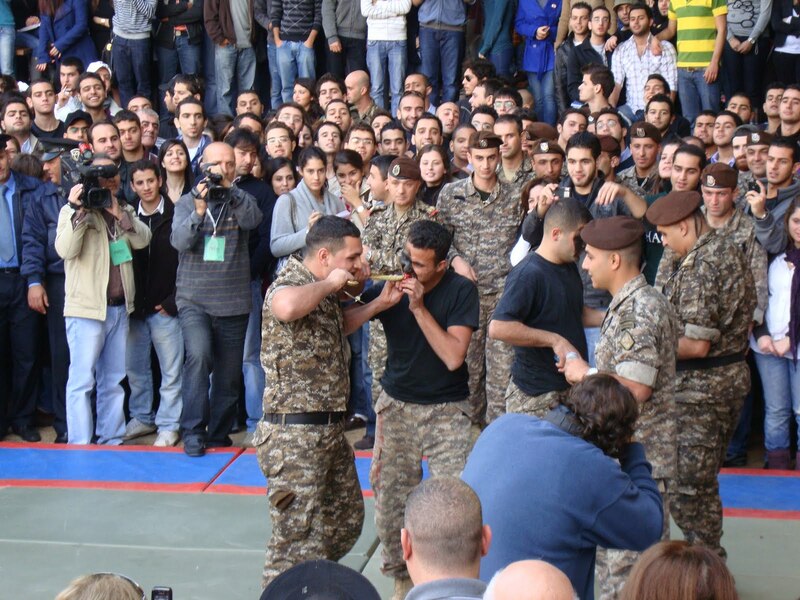 Military commandos in Lebanon eat snakes alive as part of their training. As the civil war escalated, Lebanese militias grew stronger and soon surpassed the regular army. This rapidly undermined the authority of the central government. The government's ability to maintain order was also handicapped by the nature of the Lebanese Army. One of the smallest in the Middle East, it was composed based on a fixed ratio of religions. As members defected to sectarian militias, the army would eventually prove unable to contain the militant groups, rein in the PLO or monitor foreign infiltration. Since the government was Christian-dominated, especially the officers' ranks, trust among Muslims for central institutions, including the army, was low. The disintegration of the Lebanese Army was eventually initiated by Muslim deserters declaring that they would no longer take orders from the Maronite generals. During December 1999-January 2000 an Islamic group launched a failed uprising against the Lebanese authorities in the Dinnieh district. In a period of 8 days of fighting in the snow-blanketed mountains east of the northern port of Tripoli, 14 soldiers and 25 rebels were killed. In the 2006 Lebanon War the LAF did not engage in a direct conflict with the Israeli Army, despite its threat of retaliation if the IDF pushed too far northward into Lebanon. However, Israel did bomb several Lebanese military bases. While providing aid to civilians, Lebanese troops helped to uphold order in city streets, directed refugees to safer areas, and assisted with overlooking damage done by Israeli attacks. On several occasions, Lebanese troops fired anti-air weapons at Israeli aircraft, but no damage was documented. Overall, 49 Lebanese soldiers were killed. After the 2006 Lebanon War the LAF deployed south of the Litani River for the first time since 1968 to enforce Security Council Resolution 1701. The LAF says it will not, and cannot, disarm Hezbollah by force. On August 3, 2010, the Lebanese army fired at Israeli soldiers whom crane lifted a soldier across the border, to remove a tree off the fence; Israeli troops returned fire. 3 LAF soldiers, one Israeli officer and 1 Lebanese journalist were killed in the incident (After Israeli Artillery & aircraft bombing). According to UN reports, the border fence in the area is actually inside Israel's international border. The UNIFIL force stationed in the south described the shootout as a "serious incident". The 2007 Lebanon conflict began when fighting broke out between Fatah al-Islam, an Islamic terrorist organization, and the Lebanese Armed Forces on May 20, 2007 in Nahr al-Bared, a Palestinian refugee camp near Tripoli. It has been the most severe internal fighting since Lebanon's 1975–90 civil war. The primary theater of conflict was the Siege of Nahr el-Bared. There was heavy use of the Lebanese artillery in that area to eliminate snipers posted around the cities. The conflict finally ended on September 2, 2007 with the Lebanese Army taking control of the camp after more than three months of heavy fights and a death toll of 155 Commandos and Infantrymen. The LAF Engineering Corps achieved what was seen as a feat of ingenuity during the conflict where they converted a number of UH-1 helicopters into bombers, arming them with 250 kg and 400 kg conventional bombs from old Hunter and Mirage III fighter jets. Some helicopters were also fitted with French Matra rocket pods. This was, according to observers, a decisive step that considerably shortened the conflict. A Lebanese M113 APC in Beirut, during the unrest of May 9, 2008. During the week-long clashes that occurred at the beginning of May 2008 in Beirut and other regions of the country, the army was unable to prevent rival Lebanese groups from fighting each other. This was because the army, along with the government, had thought it would have been better if rival groups would eventually end the violence and sort out the dispute between them, alone, other than involving the national army which may have led to great divisions between the soldiers, just like in the civil war. It would have also caused an out cry to the soldiers that could have died, leading to even greater divisions and blame to the political forces. However, whenever ceasefire was brought into action in a specific area or district in Beirut or else where in the country, the LAF would straight away enforce peace. On May 13, the national army had announced that if the clashes would not end as soon as possible, it would have to intervene and use force if necessary to stop them. Since the outbreak of conflict in Syria, the Lebanese Army has been deployed to prevent Sunni-Shiite clashes from taking place in the city of Tripoli, as well as in other hot zones such as Arsal and downtown Beirut. Islamic State and Jabhat al-Nusra terrorist groups have bases on Lebanon’s mountainous eastern border with Syria from where they operate against the Lebanese army and Hezbollah. Lebanon's military is coming under immense strain from the Syrian conflict spilling across the border. On June 23, 2013, intense clashes in Sidon took place between followers of Salafist Sunni preacher Ahmad Al-Assir and Lebanese troops. Following these clashes, the Lebanese Army was sent in to capture Sheikh Assir’s headquarters at Abra and apprehend him. Lebanese Army units fought against pro-Assir militants for two days in a battle that led to the deaths of at least 16 Lebanese soldiers, and the wounding of at least 50 men. Although the LAF managed to secure his complex, Assir was able to escape and was only captured in August 2015 while trying to flee the country on a false passport. On the 2nd of August 2014, following the arrest of an Al-Nusra Front Commander Abu Ahmad Jumaa; Terrorist groups Al-Nusra and ISIS launched an assault on the Lebanese Armed Forces in the town of Arsal and seized control of the town. By 7 August, a fragile truce was established as ISIS forces also retreated from the town and redeployed along the border with Syria. Their hideouts there were subsequently bombed by the Syrian Air Force. Two days later, the Lebanese Army entered Arsal in full force and re-established control over checkpoints that the militants had previously seized. ^ الجيش اللبناني. "الموقع الرسمي للجيش اللبناني | شرف، تضحية، وفاء". Lebarmy.gov.lb (in Arabic). Archived from the original on 2002-08-03. Retrieved 2016-01-08. ^ "LAF Mission". Lebanese Armed Forces. Archived from the original on 15 June 2009. Retrieved 19 May 2009. ^ "Armed forces growth (most recent) by country". NationMaster.com. 2002. Retrieved December 13, 2008. ^ "LAF Equipment". Lebanese Armed Forces. Archived from the original on 19 July 2006. Retrieved 19 May 2009. ^ معركة عنجر - تفاصيل الموقعة وأسر والي دمشق (in Arabic). Kadmous. July 5, 2004. Retrieved 2009-05-19. ^ LEARY, LEWIS GASTON (November 1913). "2". Syria, The Land of Lebanon. New York: McBbidk, Nast & Co. p. 16. ISBN 978-1-4446-7401-9. Retrieved January 1, 2009. ^ a b c d e "LAF History". Lebanese Armed Forces. Archived from the original on 2009-05-01. Retrieved 2009-05-19. ^ a b c d e f g h "Lebanese Ground Forces". GlobalSecurity.org. Retrieved December 8, 2008. ^ Khalidi, Walid. (1992). All That Remains. Institute of Palestine Studies, p.471. ^ "M60 Main Battle Tanks From U.S. to Lebanese Army". Nahar Net. November 21, 2008. Retrieved November 21, 2008. ^ Garamone, Jim (December 1, 2008). "U.S. Forces Help Lebanese Military Assert Control". American Forces Press Service - DefenseLink News. Retrieved 2008-12-10. ^ Daragahi, Borzou; Rafei, Raed (December 18, 2008). "Russia to donate 10 fighter jets to Lebanon". Los Angeles Times. Retrieved May 19, 2009. ^ "404 - File or directory not found". Archived from the original on 12 February 2012. Retrieved 25 December 2014. ^ "الموقع الرسمي للجيش اللبناني". Archived from the original on 12 February 2012. Retrieved 25 December 2014. ^ "Military Colleges & Schools". GlobalSecurity.org. Retrieved December 12, 2008. ^ "الموقع الرسمي للجيش اللبناني". Archived from the original on 3 April 2015. Retrieved 30 October 2014. ^ "Training in the FFSC". Lebanese Army website. Retrieved 2008-12-28. ^ "صور: صحف غربية تسخر من أكل الكوماندوز اللبناني لأفاعي حية في استعراض للقوة". Mz-mz.net. Retrieved 2016-01-08. ^ Wyke, Tom (2015-09-09). "Lebanese commandos eat LIVE SNAKES as they display their strength in Beirut". Dailymail.co.uk. Retrieved 2016-01-08. ^ "MEMRI: TV Reporter Visits Lebanese Commando Base and Participates in Traditional Eating of Live Snakes". Memritv.org. Retrieved 2016-01-08. ^ "MEMRI: WARNING: Extreme Graphic Images - Lebanese Army Commandos and Visiting Teenagers Eat Live Snakes". Memritv.org. Retrieved 2016-01-08. ^ "Clip Transcript". Memritv.org. Retrieved 2016-01-08. ^ "Lebanese Army Commandos Eat Live Snakes". LiveLeak.com. Retrieved 2016-01-08. ^ "Photographic image" (JPG). 4.bp.blogspot.com. Retrieved 2016-01-08. ^ "Řľů…Ůšů" Ů"ŘŮˆŘż Ůšřşř°Ůƒřą .. Ůƒůšů Řłřźů‡Řś Ů‚Ř§Řśřż Ř§Ů"Řźůšř´ Ř§Ů"Řľů Ů‚Ř§Řş ŮˆŘ§Ů"Řłů…Řłřąř§Řşř&#X". Athabat.net. Retrieved 2016-01-08. ^ "15021-4.JPG (image)". 3.bp.blogspot.com. Retrieved 2016-01-08. ^ "4571-2.JPG (image)". 3.bp.blogspot.com. Retrieved 2016-01-08. ^ "The Angry Arab News Service/وكالة أنباء العربي الغاضب: The macho fools of Lebanon". Angryarab.blogspot.com. 2009-08-01. Retrieved 2016-01-08. ^ "The Angry Arab News Service/وكالة أنباء العربي الغاضب: Lebanese Army heroism, or histrionics". Angryarab.blogspot.com. 2009-11-17. Retrieved 2016-01-08. ^ "The Angry Arab News Service/وكالة أنباء العربي الغاضب: Lebanese Army soldiers are still eating snakes". Angryarab.blogspot.com. 2010-08-20. Retrieved 2016-01-08. ^ "The Angry Arab News Service/وكالة أنباء العربي الغاضب: about the Lebanese snake eaters". Angryarab.blogspot.com. 2010-08-20. Retrieved 2016-01-08. ^ "Photographic image" (JPG). Parsine.com. Retrieved 2016-01-08. ^ Gambill, Gary C.; Endrawos, Bassam (September 2001). "Bin Laden's Network in Lebanon". Middle East Intelligence Bulletin. Archived from the original on 2008-05-22. ^ a b الجيش اللبناني. "الموقع الرسمي للجيش اللبناني | شرف، تضحية، وفاء". Lebarmy.gov.lb (in Arabic). Retrieved 2016-01-08. ^ "Israel bombs Lebanese army barracks". News.com.au. July 18, 2006. Retrieved 2009-05-19. ^ "IAF strikes Lebanese Air Force base". Jerusalem Post. 2006-07-13. Archived from the original on 2011-09-16. Retrieved 2006-07-13. ^ "Lebanese army stops Israeli helicopters landing". Reuters. 2006-07-30. ^ شهداء حرب تموز (in Arabic). Lebanese Armed Forces. Archived from the original on 2009-06-20. Retrieved 2009-05-19. ^ "BBC News - Israel-Lebanon border clash kills five people". BBC News. Retrieved 30 October 2014. ^ "Lebanon army takes control of camp after battle". Reuters. September 2, 2007. Archived from the original on April 3, 2015. ^ "Gunbattles break out in Beirut". CNN. May 9, 2008. Retrieved 2008-05-08. ^ "Lebanese army deploys troops around the country to impose law and order by force". Fox News. Retrieved 2008-05-19. ^ "Lebanon army seizes radical sunni clerics's HQ". 25 June 2013. Retrieved 30 October 2014. ^ "Lebanon arrests wanted militant cleric Ahmad al-Assir". BBC News. Retrieved 16 August 2015. ^ "Kahwagi: Army will do utmost to free hostages". The Daily Star Newspaper - Lebanon. Retrieved 30 October 2014. Wikimedia Commons has media related to Military of Lebanon. This page was last edited on 20 April 2019, at 15:52 (UTC).